The 42nd Pacific Armies Management Seminar (PAMS-42) is scheduled to take place in the capital city of Hanoi on August 19-24. The General Staff of the Vietnam People’s Army (VPA) and the US Army Pacific (USARPAC) will co-host the event. Senior Lieutenant General Phan Van Giang, Chief of the VPA General Staff and Deputy Defence Minister, will deliver a keynote speech at the opening. PAMS-42 will cover three plenary sessions, focusing on the topics of land forces’ initial responses to humanitarian assistance/disaster response (HADR), multilateral cooperation and enhancing roles in regional cooperation for HADR. The co-hosting of the seminar is expected to help the VPA enhance its friendship, mutual understanding and trust with other countries’ armies as well as demonstrate the active and responsible role of the VPA in regional common issues. 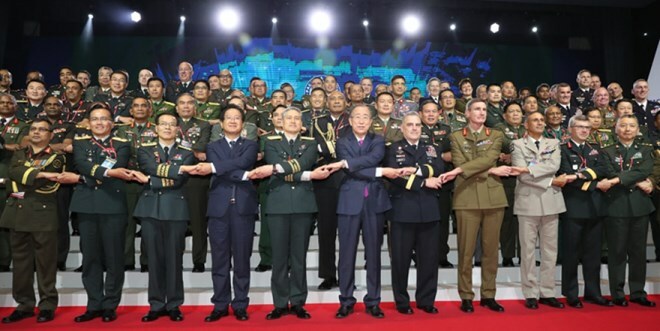 On the occasion, the involved parties will exchange measures to promote cooperation between armies in the region to cope with threats posed by natural disasters, contributing to the maintenance of regional stability. PAMS is an annual multinational military seminar providing a forum for senior-level (lieutenant colonel to major general, or national equivalent) officers from regional ground forces and security forces to exchange views. It is not only a forum to further understanding of subjects studied, but also an opportunity to establish and enhance a set of strong interpersonal relationships among the future leaders of regional armies and security forces.